“Yellow Peril,” “never trust a Chinaman,” and “the Chinese will come and eat us all up” – these are all sayings that I have known since I was a child. I overheard them as a small boy in the late 1950s, in the midst of the Cold War, without understanding what they meant. The words lodged themselves in my brain. They somehow made me prejudiced and mistrustful, but they also aroused my interest. When I began engaging with political and social issues in the late 60s and early 70s, “China” came up again. The Cultural Revolution was at its height, and I came across an essay by Peter Schneider in the cultural journal Kursbuch 16 on the essence of the Cultural Revolution. A cinema in Bern, the Kellerkino, was showing movies that focused on China, such as Joris Ivens’ How Yukong Moved the Mountains: Pharmacy No 3 in Shanghai, which was about the blessing of the new system of self-governance and the power of individual initiative. That was grist to my mill; self-governance was my thing at the time. The cinema also showed Antonioni’s Chung Kuo Cina, a 220-minute film that gives a richly detailed account of the daily lives of people in China. It was so detailed, in fact, that it was banned in China. That was rough. In 1989, I traveled via Beijing to Tibet, and shot my film Shigatse – One Injection Asks for More in just a few months. During this time, I experienced first-hand the dark side of China’s progress. My relationship to “China” remained ambivalent – I found it interesting and attractive, but I also felt insulted and angered. To better acquaint myself with China, I relocated to Shanghai in 2008 and stayed there until the end of 2014. As a visiting lecturer and advisor to Professor Wu Zhiqiang, vice-president of Tongji University in Shanghai, I gained a direct insight into Chinese university life. I made the short film Bao, the Upright Judge in collaboration with the Shanghai Peking Opera Theater, and filmed the China section of Dagmar Brendecke’s film The Fear that has 1,000 Eyes, which I also produced. I traveled extensively throughout the country, researched my film, and continued investigating the water problems on the Tibetan Plateau in Qinghai Province. In early 2016, I was appointed Foreign Expert at Tongji University, which means I will spend the next few years teaching and researching there for four months each year. Over the years, I have developed a new relationship to Chinese culture, which is an at-times highly conflict-prone co-existence between 57 ethnicities, many of whom have very different beliefs. Muslims live side-by-side with Christians, Buddhists, and Taoists. Shenism, the Chinese folk religion, is not recognized by the government. According to official statistics, the majority of the Chinese population does not belong to a religion. China has everything, and a lot of it: 1.3 billion people, half of whom live in large, mostly newly built cities; high-speed trains and primitive donkey carts; state-of-the-art hospitals and poorly equipped medical centers in villages. The differences between rich and poor, between urban and rural, are vast. The past 30 years or so have seen the opening of large factories and an enormous number of small and medium-sized enterprises that make products for Western clients and also channel the expertise they acquire into their own products and flood the market with what are usually low-grade copies. For some years now, these products have been known in China by the tongue-in-cheek term shanzhai. They are obvious imitations, fakes. People in the West mainly know about these cheap copies. They are considered illegal forgeries and plagiarism that threaten the West’s leading position in matters of expertise, and will cause businesses to lose money. This type of shanzhai, however, does not interest me, even though these copies do exist and a lot has been and will be written about them. Shanzhai originally refers to the classic Chinese novel Water Margin, in which businesspeople, farmers, monks, and soldiers rebel in the manner of Robin Hood against the corrupt regime of the Song dynasty. Shanzhai – which literally means “mountain stronghold” – was a place to which the rebels could retreat in safety after their raids. I was interested in the entrepreneurs behind the other type of shanzhai products. These goods are so much more than simple copies. They are bursting with inventiveness and variety, and follow the “Chinese recipe” of skillfully combining what already exists with continuous developments and refinements. In his book, Shanzhai – Dekonstruktion auf Chinesisch (Shanzhai – Deconstruction the Chinese Way), the philosopher and cultural scholar Byung-Chul Han writes: “In terms of design and function, shanzhai products are not inferior to the originals. Technical and aesthetic modifications give them their own identity. They are functional and fashionable. This means they can very quickly adapt to specific needs and situations.” These products consistently manage to surpass their prototypes in matters of functionality and quality, and end up becoming bestsellers. Shanzhai providers subvert the established monopolies and thus also chip away at dominant market rules and power structures. By unifying the best that the whole world has to offer, shanzhai is the epitome of globalization. Shanzhai thinks and acts at the local and global level simultaneously. It is an audacious mixture that has the potential to be explosive – especially when shanzhai products sell better than their prototypes and strike fear into the hearts of established corporations. When Deng Xiaoping initiated major economic reforms in the late 1970s, China was at rock-bottom. Its factories were outdated, its people impoverished. Many skilled workers and intellectuals were dead, and the country was utterly isolated. China began buying machines from other countries, dismantling them, and re-creating versions of them that were adapted to the requirements of the time. In other words, shanzhai. Later, many Chinese people who had studied abroad returned home, bringing with them a great deal of knowledge and experience. Through collaborations with Western companies, China also gained extensive high-tech expertise and began producing cars, high-speed trains, and intelligent electronic devices for the masses. The shanzhai way of thinking fostered a dense network of factories. Today, this ecosystem of micro- and macro-manufacturing allows products to be rapidly tested and adapted for specific target groups, and often subverts the existing and inherently sluggish production structures of established corporations. As early as January 22, 2009, the Wall Street Journal published an article entitled Imitation is the Sincerest Form of Rebellion in China. Shanzhai thus became a synonym for a counterculture, for a democratization of the world of consumer products, for a critical stance on corporate power. And since everything in China is controlled centrally by the government, it also became an indirect criticism of the political status quo and censorship. The knowledge that companies outside of China also copy each other (see the patent wars between Apple and Samsung), and the discussions about a burgeoning new understanding of copyright in the West cast shanzhai in a new light. Western trends that are reminiscent of shanzhai include open innovation, open source, open design, and open-source hardware. They also include the Creative Commons movement, in which authors voluntarily waive their copyright either in full or in part. Pioneers of Chinese shanzhai are convinced that China could lead the way in many respects in the future. If Western “open” thinking and the Chinese shanzhai approach came together, it could democratize and accelerate the development and dissemination of technology. This is how David Li, founder of China’s first hackerspace (XinCheJian) and co-initiator of the Hacked Matter research initiative, sees things: “Shanzhai and open-source hardware are twins separated at birth. If we can bring them back together, it will create some very interesting opportunities.” A Wired article by Clive Thomson, How a Nation of Tech Copycats Transformed into a Hub for Innovation, provides a good insight into the current trend. My film tells stories about people from three different generations of entrepreneurs in China. As a teenager, Ruilin Wang experienced the injustices and suffering of the Cultural Revolution first-hand. He is at the end of his career and has entered into a joint venture with Switzerland’s Bühler Group. Xiaohui Zhou’s company has successfully completed the launch phase, and Chuan Angelo Yu’s startup celebrates its first success in Silicon Valley. The mountain stronghold has changed – as have the bandits. Film director and producer Juerg Neuenschwander was born in 1953 in Emmental, Switzerland. He has been working with video and film since the early 1970s. In 1978, he co-founded Container TV, Film and Television Productions Inc. Between 1979 and 1981, he developed and led an extensive community TV project in the Tscharnergut neighborhood of Bern. 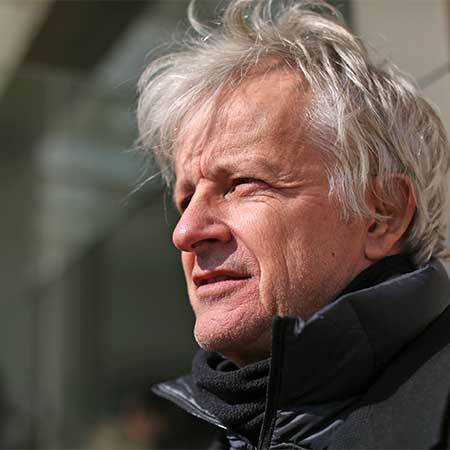 Since 1984, Neuenschwander has written numerous cinema films, TV films, and short films, which he shot in Bangladesh, Nepal, Mali, Burkina Faso, Bolivia, China, the U.S., and Switzerland. In 1999, he founded the MediaLab at Bern University of the Arts, and ran it until 2008. You can find out more about Juerg Neuenschwander on www.juergneuenschwander.com or on Wikipedia. Design nothing from scratch; rather, build on the best of what others have already done. Don’t make what you can buy for less. Innovate the production process for speed and small-scale cost savings. Buy low, sell high – and time counts as money. No innovation for innovation’s sake. Share as much information as you can to make it easy for others to add value to your process. There is little faith in the future value of IP or inventory. If sharing my specs with you means I close a deal faster, I will share them with you. Waiting a day to sign an NDA means a day longer I sit on my inventory. Don’t make it until you’ve already got a buyer. Act responsibly within the supply chain, or, do not do unto others what you would not have them do onto you. The only intangible property worth anything is good personal relationships. Your film is about three very different participants in Chinese economic life: a group of young open-source inventors who seek their fortune in California; an audio-equipment developer who uses copied blueprints and high-end components found on scrapheaps to build upmarket equipment for Chinese customers; and a multinational mechanical engineering company from Switzerland that chose to merge with its Chinese copier rather than take it to court. How did you find these stories? At the start of the six years I spent in Shanghai, I – like most other Europeans and Americans – mainly saw in the Chinese economy that perplexing image of a gigantic, uniform machine that copies products from all over the world. However, my work at the College of Design and Innovation at Tongji University in Shanghai soon brought me into contact with innovative Chinese people who do not limit themselves to crude copying. Rather, they use existing technologies found online as a basis for primarily developing products that take the needs of Chinese customers into account. And how did that turn into an idea for a film? In 2010, I met David Li, and entrepreneur and co-founder of XinCheJian, China’s first hacker/makerspace, which gives startups access to technological and business infrastructure. Li introduced me to a rapidly growing young scene in Shanghai and Shenzhen, where a Chinese Silicon Valley for the production of open-source hardware and software is developing. The creative lightheartedness of these people comes from the ancient Chinese shanzhai tradition, which sees the development of humanity as a permanent, boundless, innovative process of learning and growing in which existing knowledge is explored, modified, and turned into something new. From this perspective, there are no originals and no copies. In fact, you are pleased if competitors use your product as the basis for a more advanced version, which you then analyze inquisitively and use as the basis for your own progress. I wanted to make a film that would allow people to see this other side of the Chinese economy. And how did the idea become a film? I wrote a screenplay that told three stories about participants in the shanzhai economy. They show how, in the midst of the incredibly rapid changes happening in society and the economy today, this tradition offers millions of hard-working “little people” the chance to forge a future for themselves. The Swiss Federal Office of Culture, the broadcaster Swiss Radio and Television, the Berner Filmförderung funding body, and various other funders were all interested in the concept of the film. As a result, financing the film was not the uphill battle it usually is. How did you come across the specific stories that feature in the film? With David Li’s help, I gained access to a Shenzhen incubator in which investors help startups develop to the point where they are ready for market. The investors pay a portion of the development costs up front and, providing the company is a success, secure themselves a big share of the profits. This incubator was where I met the young open-source entrepreneurs who, at the time, were primarily building drones with their company Hex. Their spontaneity and tenacity fascinated me. We accompanied them as they approached Chinese authorities and U.S. organizers in a bid to win the right to attend an open-source inventors’ fair in California. We were also there when an American entrepreneur, who knows every trick in the book when it comes to capitalist competition, offered not only to market their products in the U.S., but also to produce them in Mexico and sell them worldwide. “What will be left for us to do then?” asked one of the Hex team on the journey back to China, making his fellow developers laugh. The second story shows Xiaohui Zhou, a designer of audio equipment, in his workshop in Shanghai. How did you find him? When I arrived in China, I needed a new amp and speakers, so I started looking for high-end Chinese products. I trawled through Tabao, an immense online marketplace, and Zhou’s online store caught my eye. He describes exactly which global-market devices he uses as a starting point, and how he improves them. Zhou promises that his products are “better than the original.” He told me how he came to be a small business owner. Before becoming self-employed, Zhou had worked at Panasonic. During his time there, he realized that as long as he worked in an international corporation, he would always be “the Chinese guy” and would rank below his bosses from the U.S., Japan, and Europe. I met Zhou several times over a period of four years. In 2012, I decided to tell three stories in the film – and that one of them would be Zhou’s. How did the Swiss multinational Bühler Uzwil end up in the film? The Swiss Chamber of Commerce in Shanghai publishes a magazine. In one of the issues, I read an interview with Dieter Vögtli, who is president for China and Southeast Asia at Bühler, a Swiss mechanical engineering company based in Uzwil. The picture showed him on a Chinese-cloned motorbike. And in the interview, Vögtli said that he had a positive view of the shanzhai system and had learned a lot from competitors who copied Bühler products. I found that very surprising, so I immediately called him up. He wanted to see one of my films first, but then agreed to show us how Bühler Group had merged with the Chinese company Baolong – which had persistently copied Bühler’s feed-processing systems – instead of filing patent suits against it. In collaboration with Baolong, the Swiss company used its world-leading, high-end products – which only customers in rich developed countries can afford – as a basis for building simpler, cheaper systems. In doing so, Bühler opened up markets in other newly industrialized countries, such as those in Africa and South America. A few years later, Bühler took over Baolong. The global corporation used shanzhai without losing control. What was it like making this film in a state as authoritarian and closely monitored as China? We had almost no problems at all. I deliberately filmed without a permit. I didn’t want to have anything to do with the authorities. We worked with small, mixed teams and without artificial lighting. In public areas, we would appear from nowhere and disappear again quickly. We always had answers ready if local police or wardens asked us any questions. My position at the College of Design and Innovation also meant that the film was a university research project. Of course, as foreigners, we were constantly monitored – but we were only hampered once. It was at China’s biggest electronics scrapheap in Guiyu, where Zhou sources the components for his high-end audio equipment. I had actually registered this shoot, but we were swiftly forced to leave – not by the state police but by security personnel working for the owners, who belong to the mafia, and riding in a fake police car. A BBC documentary exposing severe pollution and life-threatening working conditions in Guiyu had led the Chinese authorities to impose strict measures on the facility. The owners clearly didn’t want to see their multi-billion-yuan business destroyed by foreigners again. How did you communicate during filming? I don’t speak any Chinese. During filming, I often only had a very rudimentary idea of what our interviewees were saying. It was therefore important that my Chinese assistants Junjie Lin and Hang Cheng, and my consultant, the Austrian sinologist Ingrid Fischer-Schreiber, were present during the interviews and during editing. Watching your film, it feels like we are seeing the protagonists going about their daily lives. To what extent is that really the case, and were any sections staged? Even documentary films need directorial decisions. You decide to only film excerpts of long processes, and you ultimately edit 100 hours of filmed material down to just 90 minutes. That’s directing. In terms of documentary quality, it is important that the truth guides your selection and combination of the film material. I actively stage-managed once sequence – the one where a customer buys a piece of audio equipment from Zhou’s store and then hails a cab to get it home. We called a cab driver who I had already met when he was buying something from Zhou. This resulted in two of Zhou’s customers talking about him during the cab journey.